OMEGA’s PXM6000 Series Pressure Transducer fits easily into your application. 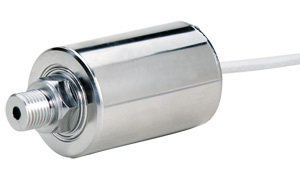 This low cost transducer is small and light, and mounting requires no bulky structures.The sensor is a small, about 2.5 mm, square silicon chip with four diffused strain gauges, mounted in the stainless steel case. Laser trimmed resistors provide temperature compensation and adjust zero balance and span. The 0-5 Vdc output is compatible with most control and data acquisition systems. The PXM6000 uses solid state media isolation for improved reliability. Thin films of chemically inert materials are deposited or grown on the chip surface to provide electrical isolation between the sensor and pressure medium. The sensor is less sensitive to vibration and more dependable in high shock environments because the films add no significant mass. Corrosion resistance is outstanding, and the isolation will remain effective because there is no gel or oil column to deteriorate. The PXM6000 is also available in standard/Imperial configurations, with MS, NPT or UNF ports, and models from 0-15 to 0-300 psi pressure ranges. Please see the PX6000 for complete details, or contact our Pressure department for more information..
For special options consult Sales or Pressure Engineering.